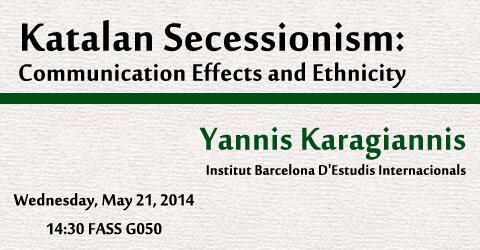 Yannis Karagiannis (Institut Barcelona D'Estudis Internacionals) will be visiting our campus on Wednesday, May 21, 2014, in order to give a lecture in the scope of ES 523 course. His lecture is entitled: "Catalan Secessionism: Communication effects and ethnicity". Over the past decade Catalan politics has focused on the issue of secession from the rest of Spain. The ensuing polarization of opinion creates two questions of paramount importance for social scientists: (a) How strong are individual preferences? And (b) what determines these preferences? To answer these questions, we use a custom-designed survey experiment (N = 913) which allows us to estimate the effect of frames net of confounding effects, and to determine other determinants of preferences. We find that frames matter even in polarized political times and when slow thinking has preceded. We also detect a strong role for ethnicity, measured as the number of Catalan-speaking grandparents and language spoken at home, as well as for the geographical scope of professional activity. Our findings help challenge the economic approach to politics, whereby agents hold well-defined and constant preferences, and give support to the view that both short- and long-run constructivist elements play a crucial role in centrifugal political movements.